Wine Rack. (c) 2006 Chris Baylor licensed to About.com, Inc.
A wine rack is a very common beginner's woodworking project. However, I think this particular modular wine rack is an enjoyable project for any woodworker, as it requires making some curved cuts and dadoes. 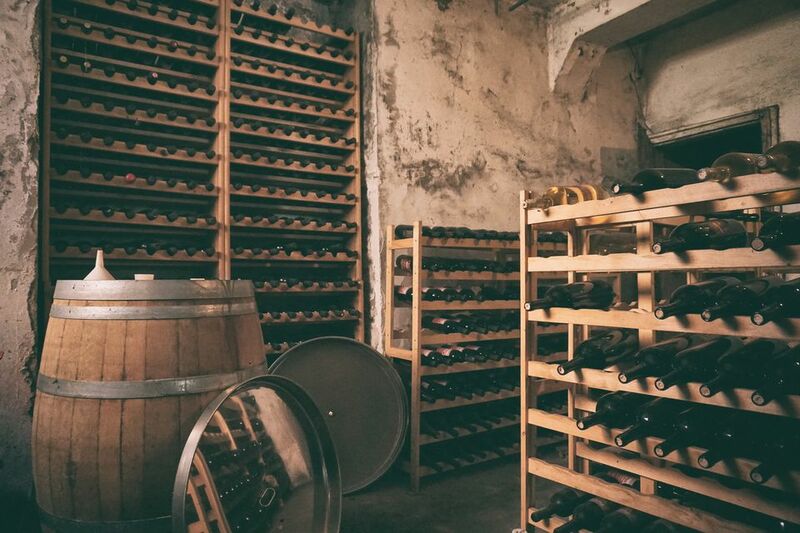 For such a simple project, numerous people have commented on just how attractive the rack becomes when a few are stacked together and filled with wine. Because of it's sturdy, yet modular design, there really isn't much of a limit as to how many units can be assembled on top of one another. In the picture above, we have stacked five of the units together to hold 30 bottles. You can use almost any wood you like to build these free woodworking plans, but keep in mind that the sides require one-inch thick stock. This means either buying 2x stock and planing it down, or purchasing 4/4 stock at a fine woodworking supplier, which will restrict your choices of stock to those species available in 4/4 at the time of your purchase. Download the to build this modular wine rack (PDF). Cut the Dadoes. (c) 2006 Chris Baylor licensed to About.com, Inc. The first step to building the rack is to work on the two sides. These are made from 4/4 (1-inch thick) stock of the species of your choice. Oak and Maple make beautiful choices if the unit is to be stained, while Poplar is terrific if you intend to paint the rack. Cut each of the two pieces of 4/4 stock to 6" x 9-3/4". Next, you'll need to cut four notches in each piece to accommodate the front and back of the unit. These notches are cut on the long (9-3/4") edges, 3/4" in from each end. The notches will be 1/2" deep and 3/4" wide (the width of the 1x stock used for the front and back). To cut the notches, set up a stacked dado set in either your Table Saw or Radial Arm Saw to 3/4-inch in thickness, and set the depth to 1/2-inch. Because you'll be cutting the sides on edge, it would be safest and smoothest to clamp the two sides together and cut the dadoes on both pieces of stock at the same time. If you plan on building more than one set of this wine rack, try cutting four sides at a time. If using a table saw, be sure to use a miter gauge to guide the stock - do not use the fence, as the stock could bind against the fence as it is run through the saw. Once you have the four dadoes cut, move onto the cutout within the sides. You can either cut two 2-1/4" holes and clean the stock between with a jigsaw or simply cut the entire cut out with the jigsaw. The edges of the holes will be 2-1/8" in from the edges (along the center line), with the entire width of the cutout measuring 5-1/2", as shown in the plan diagrams (which can be downloaded from the first page of this article. The last woodworking step on the side panels is to cut a 3/8" diameter hole (about 1/4" deep) centered in each of the four dadoes to accommodate the dowels in a later step. Cut stock to length. (c) 2006 Chris Baylor licensed to About.com, Inc.
Now that the sides of the wine rack have been finished, we'll move onto the front portion of the unit. Cut a piece of 1x4 (of your chosen wood species) to 28-5/8" in length, and then rip it to a 2-1/4" width. If you are only making one of these units, you'll likely want to use a band saw or jigsaw to cut the notches for the bottles, but if you are building an even number of the units, you can save some time on this step by using 1x6 and cut the notches with a 1-5/8" drill bit, then rip the board down the middle on your table saw to the finished 2-1/4" width. Otherwise, you'll need to cut six half-round notches in one long edge of the front with your jigsaw or band saw. The notches begin 3-1/2" in from one end, and are spaced 2-3/8" apart, as shown in the free downloadable plans (from page 1). Once the six notches are cut, you'll be cutting dadoes in the opposite edge, much like we did on the sides. In this case, however, the dadoes are 1" wide and 1" in from each end. However, they are still 1/2" deep. Finally, drill a 3/8" hole, 1/4" deep, centered in each dado to accommodate the dowel in a later step. Cut the arcs for the bottles. (c) 2006 Chris Baylor licensed to About.com, Inc. The last major woodworking step in this project is to create the back of the wine rack. The procedure is very similar to the front, except that the holes for the wine bottles will be 4" diameter rather than 1-5/8". This could be accomplished using a 4" hole cutter on a drill press, but you would probably get better results using a jigsaw or band saw. If you intend to cut the piece individually, you'll want to start by marking the arcs for the notches, which are cut to a 2" radius arc, 1" deep into the piece. The first arc's center is 4-5/16" in from the end, then every four inches on center. Once you have the arcs marked, you can rip the piece of stock to 2-1/4" thick with the arcs each 1" deep. The final length of the piece is once again 28-5/8". After ripping the piece to width, you can cut the arcs with your jigsaw or band saw. Finally cut the dadoes and place the dowel holes, exactly as performed on the front. Sanding the wine rack. (c) 2006 Chris Baylor licensed to About.com, Inc.
Now that the woodworking is completed, we move on to sanding and the finish. Sand each of the four pieces of the modular wine rack using progressively finer sandpaper. Finish with a hand sanding for a perfect final touch. Next, clean all of the sawdust off of the pieces and wipe it thoroughly with a tack cloth. Then, apply the paint or stain of your choice. If you are staining soft woods, you may want to apply a pre-stain wood conditioner to help even out the stain. Then, after staining, apply a few coats of polyurethane to protect the wood. Setting the Dowels. (c) 2006 Chris Baylor licensed to About.com, Inc. The last step before assembly is to place the dowels into the holes inside the dadoes. Cut eight pieces of 3/8" dowel to 1/2" in length. Place a drop of glue in each dowel hole of one of the side pieces, and then tap one dowel into each of the four holes. Use a block of scrap wood to get the dowel properly seated in the hole. Follow-up with the same procedure on the other side unit. Assembling the Wine Rack. (c) 2006 Chris Baylor licensed to About.com, Inc.
Now that the woodworking project is completed, we'll assemble the wine rack. Attach the front of the wine rack to the right side piece by sliding the dadoes onto each other, as shown in the picture above. Proceed by adding the back of the wine rack to the right side piece in a similar manner. Then, attach the left side panel to the front and back of the wine rack at the dadoes. Check all four connections to be certain that all four dadoes are properly seated. One Wine Rack. (c) 2006 Chris Baylor licensed to About.com, Inc.
At this point, you're done with the first rack. 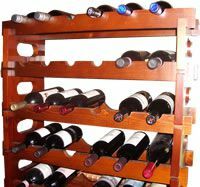 You can add more racks to build a stacked set or simply add wine to your existing rack. When you have more wine, you can add more racks! Need ideas for some great wines to add to your wine rack? Our Wine guide can help you find wine for every occasion.